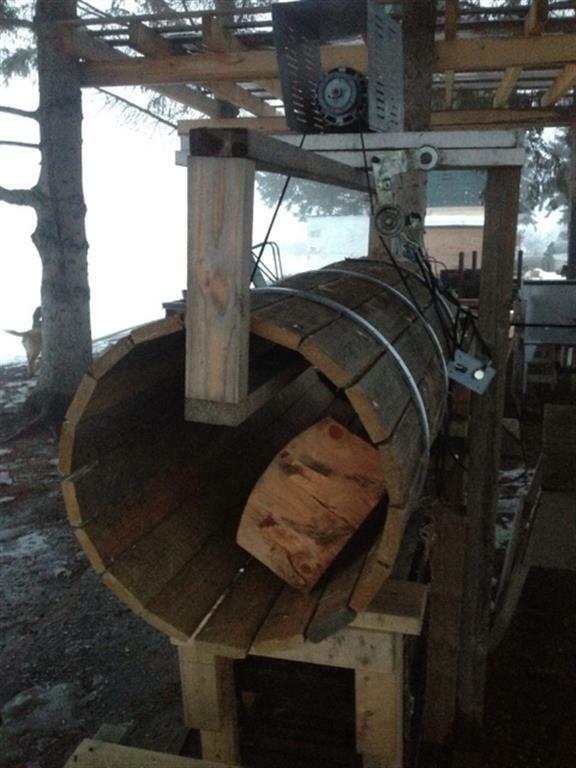 Food of the Sun Farm's Matt Lougheed recently jumped on the phone with me to talk about the barrel-type root washer he built for his farm, saving himself a couple grand in the process. Below, you'll find our conversation about his project, a written description, some photos, and a video he shot. Enjoy! This is our root veg washer that I came up with. Did a bit of research before I started, went and looked at a few different ones that other farmers had purchased and looked online at some ones that you buy and put together (buy your own lumber) for around $2000. You can also buy a full kit for around 3500-4000$. We couldn't justify that but we needed a more efficient way to wash. I decided if other people can build one, I could too. The drum I came up with is made out of 26" bicycle rims and 1x4 rough cut fir. I borrowed that idea from a guy online. The drive was a bit tricky. Research showed there were motors with gear reduction, human powered (riding a bike/turning by hand) and treadmill motors that are on a variable frequency drive. I didnt like the idea of messing around with a gearbox and I was driving home from work one day and noticed a "free stuff" sign. So I pulled in and behold a working treadmill! Tore it all apart got the motor and the circuit board out. I used a belt from an old chrysler town car and went around the whole drum (this gives a large speed reduction)... I was shooting for about 15-30 rpms. The motor is mounted on top and speed is controlled by the a dial. The drum turns on 4 casters that sit inside the bike rims. It seems to work great for keeping everything in place. The stand is an old bbq stand modified to fit the casters,drum,motor and spraybar. The spray bar is pvc with holes drilled into it, and it is stationary inside the drum. All you do is hook a hose up, turn the motor on, put a crate on the exit side and dump in the veggies! It has been a huge help and I really liked building it. It can wash roughly 150-200lb veg/10min depending on how dirty or what variety of veg. Got something worth sharing here? Email me...editor@theruminant.ca.